This morning we had a rain here in Shirahama, but the weather was changed and became a sunny day! I went to the beach to swim with my children for the 2nd time this summer. There still were a lot of people on the beach. The sea was really blue and beautiful, but we had big waves today. 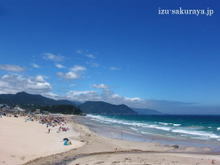 This entry was posted in beach on 2009年8月24日 by izusakuraya. Last night the weather forecast said that it would be cloudy today, but it was sunny actually. I went to the top of mountain behind our Pension to take photos. I could see a lot of beach parasols on the beach. The water was blue and gorgeous today. 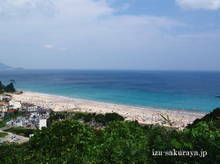 This entry was posted in beach on 2009年8月22日 by izusakuraya. 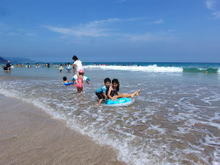 2009/08/20 I went to the beach with my children. We are very busy every day in summer, so we can’t go to the beach though we live near the beach. Today we had a chance that we can go to the beach. After I finished my job we went to the beach with them. The water became very warm and was really clear! My children were able to play in the water and they had a great time on the beach today. 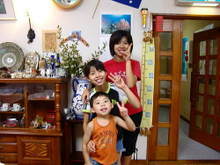 This entry was posted in beach, Family on 2009年8月20日 by izusakuraya. 2009/08/16 Hello, how are you? Hello, how are you everybody? We are very busy everyday, but we all are very fine. This summer my daughters help us at the dinner time. It is a big help for us, because they work very well. This entry was posted in Family on 2009年8月16日 by izusakuraya. Today it was August 13th. We, Japanese have a long holiday called "Obon" at the middle of August, between August 10 and 16. I think this is one of the longest and busiest holidays in Japan. The majority of Japanese travel inside and outside Japan and most of traffic, sightseeing spot, road, hotel, amusement park and other places would be occupied and very busy at everywhere in Japan. So there were a lot of people on Shirahama beach today. 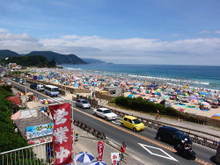 I show you the other beach in Shimoda, called "Sotoura" beach…. This entry was posted in beach on 2009年8月13日 by izusakuraya. As you know we had a typhoon and earthquake here in Shizuoka Pref. this week. However, there was no problem in Shimoda completely. I went to the beach to take photos of Shirahama beach today. There were a lot of people as usual on the beach. I am showing the photo taken on the beach….. 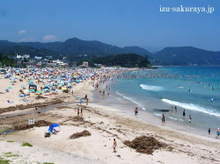 This entry was posted in beach on 2009年8月12日 by izusakuraya. Today it was very beautiful day, but we had a strong wind in the morning. There were a lot of people on the beach, but they put their parasol toward the wind. However, it was very hot this afternoon. I wanted to swim there!! 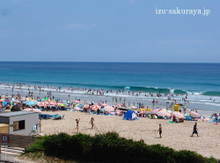 This entry was posted in beach on 2009年8月4日 by izusakuraya.